Horse keyboards with equine art printed directly on a wireless computer keyboard. PC or Mac compatible. 102 key layout with numeric keypad. Connects to your computer via included USB dongle for easy "plug and play" functionality. (If you don't know what a USB dongle is please scroll down beneath the keyboards for sale for more information). Below: A horse keyboard with a grazing horse printed directly on the keyboard. From Zazzle. Have the horse art printed directly on the keyboards, as opposed to being a "skin" or cover. Are compatible with either a PC or Mac. When looking at a keyboard for sale on Zazzle you may notice the description says something like: "Easy plug and play installation with included USB dongle." This might have you thinking: "What's a dongle?" A dongle is a small device that connects to a computer in order to allow wireless communication between the computer and something else. For example, a dongle is commonly used to allow a computer to communicate with a mouse or keyboard. The photo below shows a dongle beside a laptop computer. 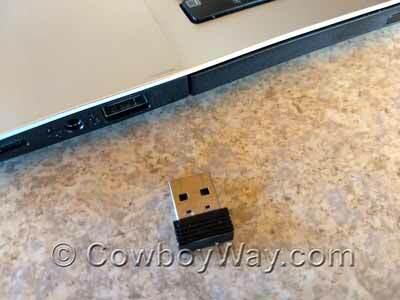 When it's plugged in to a USB port, this particular dongle allows the laptop to wirelessly communicate with a mouse. Dongles are also commonly used to allow computers to wirelessly communicate with keyboards (like the keyboards on Zazzle). Below: A dongle laying beside a laptop computer. Not all dongles look the same, so other ones could look different than the one shown here. 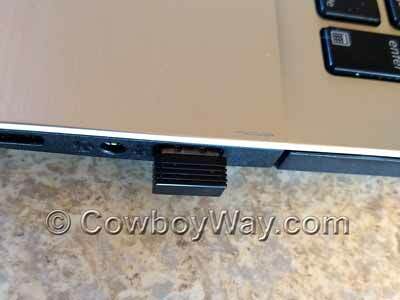 Below: The same laptop and dongle as shown above, only with the dongle inserted into a USB port.